Hermes -- A pristine brand that speaks true elegance and class in the design industry. Their collection of bags may run through your mind as we speak but put aside your love for the Birkin for now because Hermes also comes with home products to turn your interior into a masterpiece. From the living accessories to the dining wares, Hermes never disappoints when it comes to the fine detailings. We’re aware the home products may cost a little much but trust us, the personal beautiful craftsmanship is worth the spending. Your living space needs something that pops out in the midst of the neutral ensemble and Hermes Avalon pillow could do just that. 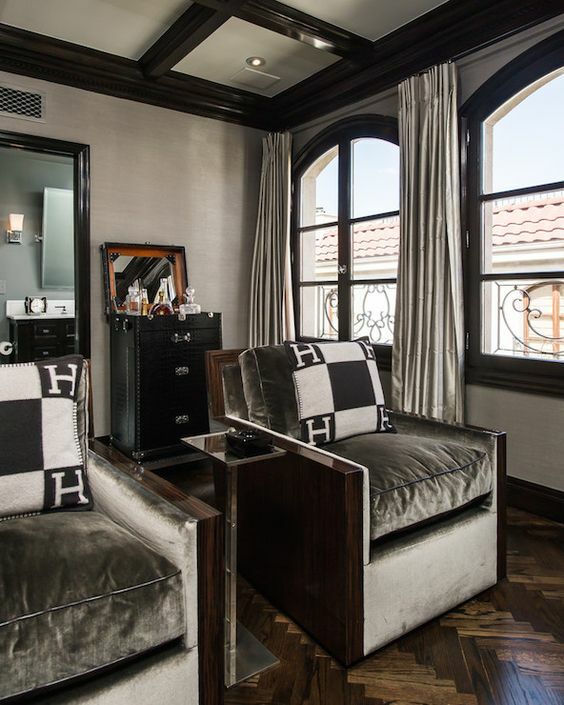 The checkered pattern complemented with Hermes signature letter gives the ultimate contrast and perhaps a little bit of the classic opulent touch to your interior. Here’s the trick to enhance the opulence in your interior with this fine pillow: Keep your couch in one tone -- preferably wrapped in the lavish velvet fabric -- and toss in some brass and gold accents into the picture! The colour palette is just perfect for one another, we must say. If you’re loving the pillow, Hermes has got the ideal pair that matches the look. The Avalon III throw blanket is designed in the exact pattern of the pillow, and it’s divinely comfortable even at a glance! Made from wool and a tinge of cashmere, the throw blanket isn’t just made for show. You may as well go out in style with the blanket and high knee boots whenever the weather gets cold! Place the blanket either in the living room or your bedroom. Lay it flat on the couch or the bed to make your space visibly wider and more spacious. If you intend to keep the interior more minimal, fold the blanket and place it on the side of your couch. Note: The blanket works best on light surfaces complemented with cushion pillows of the same colour palette for an infinite timeless vibe. Hermes tableware gets you to dine lavishly in style and Carnets D’Equateur collection is the ultimate showstopper. The porcelain dinnerware breathes the wild life in the natural setting through the eyes of the talented naturalist and painter Robert Dallet. Bold and definitely made rare, Carnets D’Equateur pieces deserve a place on your table as a wow-factor in your interior. The gold edges on the dinnerware define such a strong character on their own therefore your dining table cloth can be in the lightest shade possible to bring out the porcelain design. Best dined with golden cutlery, you may as well mix and match the dinnerware with any plain white or black porcelain dinnerware to make the look more exclusive. Complement the set with some crystal glassware and voila, you shall dine like a king! Where else could you place those loose items and coins but on a plate? Well, you can never go wrong with turning the dinnerware to a decorative piece to add a little bit of glam to your boudoir. Hermes Mosaique Au 24 Gold square plate for one is an absolutely magnificent piece that depicts opulence even at a glimpse! This porcelain art piece is a tribute to Hermes’ voyage from the start at its very first store in Paris that displays the lavish array of the mosaic pattern on its flooring. Placing the plate on your boudoir complemented by a minimal range of other fine beauty and decorative items in gold would give an elegant touch to the look. Subtle-toned flowers and candles, for instance, would be the perfect company to this art piece. Another way to keep the loose valuables is on a tray, of course! Hermes Sellier change tray is all you ever need to make your console or side table stand out in the midst your home’s ensemble. The porcelain tray displays a rich, vibrant red with a classic pattern in gold. Perhaps a dramatic artistry, but then again who doesn’t love the drama? Hermes Sellier change tray is beautifully adorned with its own pattern and label that the tray carries its own character. Hence, it could be placed on the table even merely as a display. Accompany the piece with some silver decorative objects to create a balance to the look. Add on a sculpture or figurine by its side to make your space more prominent, and your interior is ready for show. Hermes is synonymous to the fine opulence where class meets taste. The intricate and unique artistry of each product -- from the fashion to the home accents -- are done with such pristine that Hermes has earned its name in the prestigious fashion world, and now expanding into the interior industry with such grace. Well, brava Hermes!